Kaukapakapa is a town in the North Island of New Zealand. It is situated in the Rodney district and is around 50 kilometres northwest of Auckland. State Highway 16 passes through the town, connecting it to Helensville about 12 km to the south-west, and Araparera about 14 km to the north. The North Auckland Line also passes through Kaukapakapa. The Kaukapakapa River flows from the town to the Kaipara Harbour to the west. "Kaukapakapa" is a Māori name meaning "to swim with much splashing"
The town is commonly known to the locals in its shortened form "Kaukap". Pronounced Cow-Cop-ah-Cop-ah, Or correctly Koh-Cup-a-Cup-a. 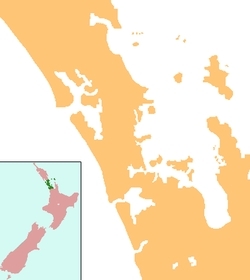 The population of Kaukapakapa and the surrounding district was 2,979 in the 2006 Census, an increase of 711 from 2001. European settlement of the area began in 1860 when the Government bought land from local Maori. Small number of settlers arrived from England and Scotland, and a Methodist church was built in 1872. A monthly boat service operated between Kaukapakapa and the northern Kaipara from 1863. The population of the area was 311 in 1881. The town developed split between the northern and southern banks of the river. Although roads connected the town to Riverhead, Tauhoa and Helensville by the early 1880s, they were of poor quality, and most access was by the river. The roads were still mostly unmetalled in 1920. The kauri timber industry was responsible for developing the area, with logs floated down the Kaukapakapa River to the Kaipara Harbour, where they were loaded onto ships for export. Gum-digging (beginning in 1873-74 and continuing until at least 1914) and flax processing (in the 1880s) were also significant early industries. A shipyard operated from 1864 and into the 1880s. The North Auckland railway line reached Kaukapakapa in 1889. A creamery was built next to the railway station to service the developing dairy industry. Genesis Energy has proposed to build a gas-fired power station near Kaukapakapa. The proposal is opposed by the Kaukapakapa Residents & Ratepayers Association and Kaipara Forest and Bird. The school celebrated its 125th reunion in 1998. This page was retrieved and condensed from (http://en.wikipedia.org/wiki/Kaukapakapa) see Wikipedia, the free encyclopedia, January 2009.